Entry No. 318, Episcia 'Pink Dreams', exhibited by Jill Fischer. Score: 93. First Place. Entry No. 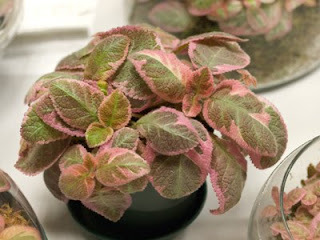 435, Episcia 'Pink Smoke', exhibited by Charlene Marietti. Score: 89. Second Place. Entry No. 317, Episcia 'Pink Smoke', exhibited by Jill Fischer. Score: 88. Third Place. Entry No. 118, Episcia 'Pink Dreams', exhibited by Carol Hamelink. Score: 87. Entry No. 357, Episcia 'Cleopatra', exhibited by Stephen Maciejewski. Score: 85.